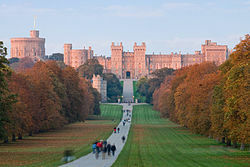 Windsor Castle is notable for its long association with the English and later British royal family and for its architecture. The original castle was built in the 11th century after the Norman invasion of England by William the Conqueror. Since the time of Henry I, it has been used by the reigning monarch and is the longest-occupied palace in Europe. The castle's lavish early 19th-century State Apartments were described by the art historian Hugh Roberts as "a superb and unrivalled sequence of rooms widely regarded as the finest and most complete expression of later Georgian taste". Inside the castle walls is the 15th-century St George's Chapel, considered by the historian John Martin Robinson to be "one of the supreme achievements of English Perpendicular Gothic" design. This article uses material from the Wikipedia article "Windsor Castle", which is released under the Creative Commons Attribution-Share-Alike 3.0 License.